MAXQDA is a powerful computer-assisted qualitative data analysis (QDA) software. This may sound very technical, but in layman’s terms MAXQDA is a software application which helps researchers and analysts gain insights from written or text documents such as submissions or open text questions in a survey. Traditionally QDA software has been targeted at researchers and academics however an increased demand in qualitative research-driven by public consultation and engagement by government agencies, has seen QDA software adapt to this demand. One of the big advantages of MAXQDA is that it works with a huge range of data formats. This means you can analyse text documents, survey data (both categorical and qualitative) as well as social media posts. MAXQDA also supports a number of different file formats including text, audio, video, and images. Often one would have to use a number of different programs to analyse different types of data. PublicVoice recently worked on a project that contained data from online surveys and submissions, formal submissions that were sent to the client including handwritten letters, public meetings and hui where notes were kept. Expand the section below to view all supported data types. 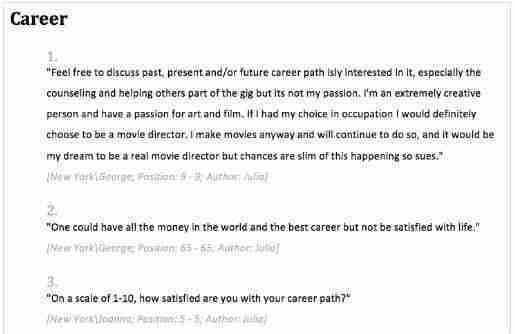 Interview transcripts, field notes, observation logs. Time stamps allow the synchronization of transcript and sound. Data can be transcribed and synchronized with the transcript. Video and audio can be coded directly. Direct import from SurveyMonkey Exported data matrices from Consult24, EngagementHQ, Consultation Manager, Social Pinpoint, SurveyMonkey, TypeForm, Qualtrics, SurveyGizmo, Web forms etc. Often when working on a large project containing multiple sources or types of data, a separate file is required to store the different types of data. Each file has to be imported, analysed and saved separately. With MAXQDA all your project data is stored in one project pack. This means your MAXQDA project pack becomes the single repository for all project data. The Document System allows you to create folders to manage your project data. 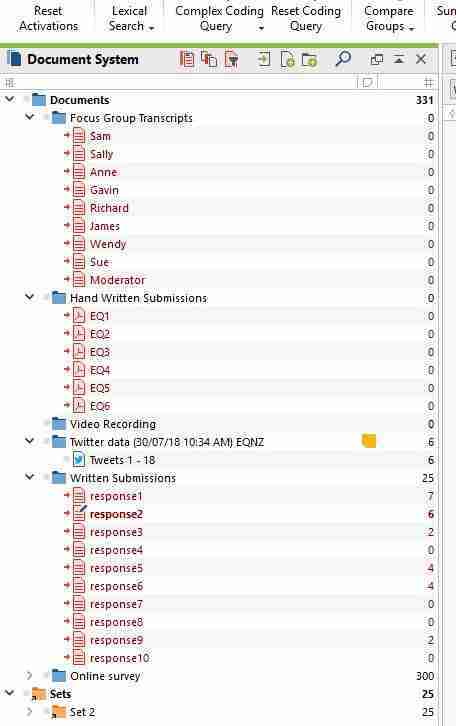 The image below shows the Document System with for sets of data namely the focus group, submissions and survey data (W1, W2) which has been imported in waves. From the Document Systems window, one can manage their data, view individual inputs and conduct a wide range analysis. Often larger consultation projects involve working with a team of analysts. The management of teams is made easy with the MAXQDA user management system, memos, intercoder agreement and the ability to share files. 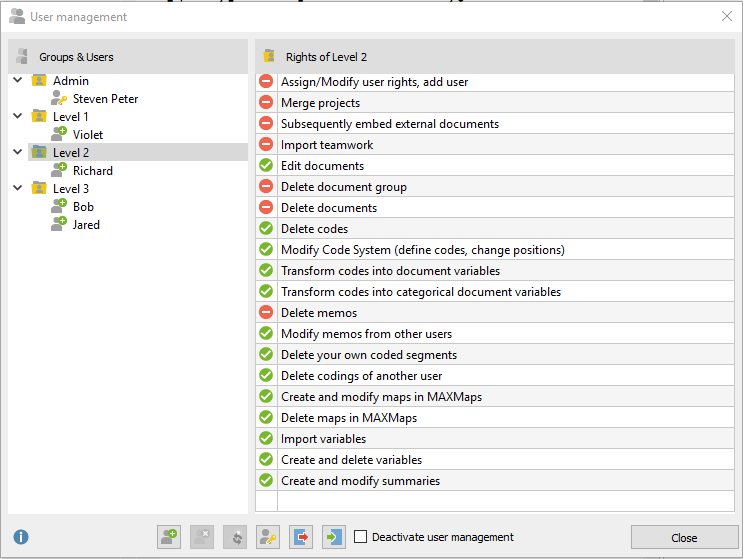 In the User Management System, administrators can set user rights based on their role within the project. These rights include the ability to add users and set their rights, import or delete documents and variables, edit or delete codes and memos among other tasks. Different levels of users can be created with different customised user rights. Often project leads need more user rights than team leaders while analysts often only need basic user rights. Often on a project, you will have more than one person coding the data. It is important that analysts code the data in a similar manner, this is managed through memos and intercoder agreements. Memos are a bit like post-it notes that can be attached to individual documents, document groups, codes. 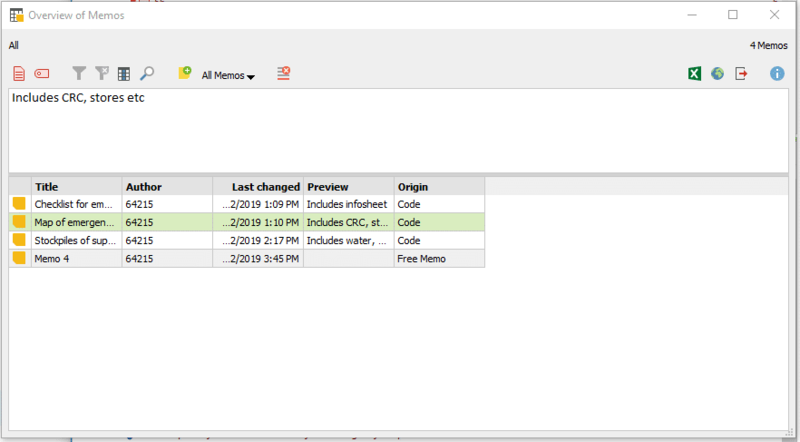 Memos can be used to describe how the code is applied, define terms or just record observations for later. PublicVoice have used memos to note trends within code but also to make notes to follow up when we are reviewing the code structure. These memos have included notes about potential codes to merge or separate out and later discussed with the project lead. The Intercoder Agreement enables comparison of coding by different analysts. The purpose of this is to compare how different analysts are coding the same data, identify the differences and achieve a high level of coding agreement between analysts. One of the major challenges of teamwork is the sharing of files and making sure everyone is working with the latest data. This has been made easier with MAXQDA Exchange Files (.mex). A person saves their document as a .mex file and sends it to others within the team who then import this file into their own project pack. The logbook can be used as a journal of your analysis allowing you to keep track of what has been done and by who. The logbook automatically enters date, timestamp and user at the top of the entry and the team member enters in a sentence or two of free text describing what they have done. The logbook can be exported from MAXQDA or printed off. As the analysis of the data is done each code is date and time stamped along with the user who created or assigned the code to that piece of data. Not only this but with the intercoder agreement discussed above a manager can compare the coding of data by two analysists to ensure consistency in coding. Memos can aid in coding as well as auditing. We have already discussed how memos can be attached to code to define terms, describe how the code is applied or any exclusions. An overview of the memos can be exported or printed off for auditing purposes. The Codebook lists all the codes used in the project or one can select codes to be included in the codebook i.e. 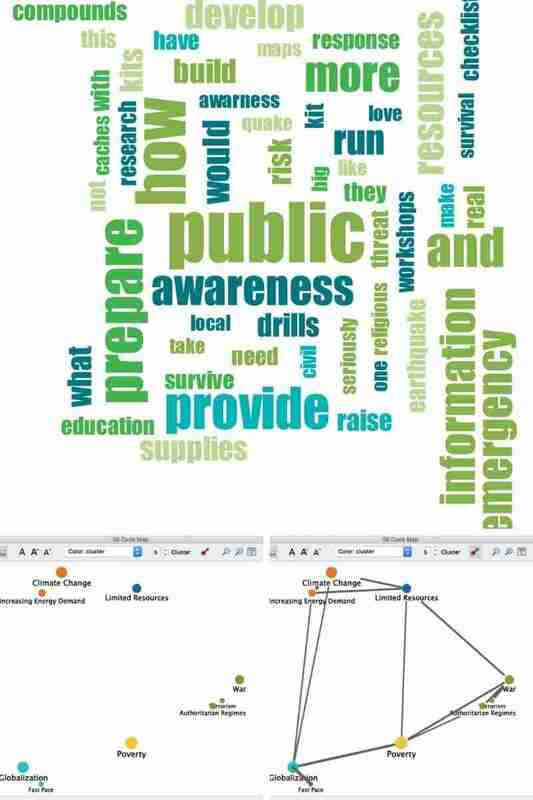 all the codes applied to survey data in our mock earthquake preparedness consultation. The codebook also records memos attached to the codes. This can be exported or printed off and can be handy to attach as an appendix to a report. A lot could be written about the qualitative analysis functions of MAXQDA. In a nutshell, MAXQDA can make short work of your analysis project with its wide range of analysis functions which includes auto-coding present in MAXDictio. 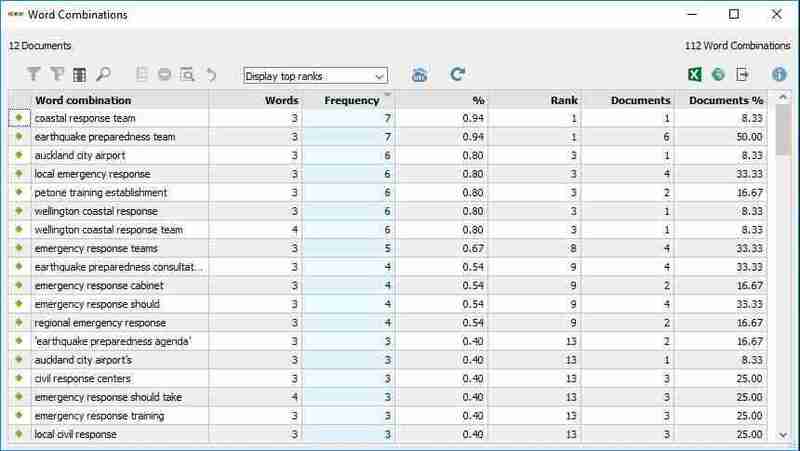 Word frequencies and word combinations are two useful tools right at the start of a project when you are looking at how you are going to code your data. 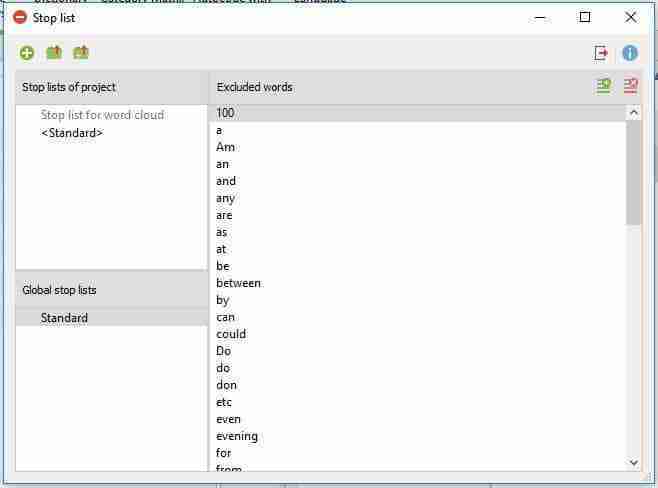 These two tools count how often a word or a combination of a word occurs in an activated document or set of documents. Outputs from the word frequency and word combination tools. These can aid coding. The keyword-in-context function allows the analyst to see how keywords are being used and again can be helpful in understanding the data at the start of the project and when looking at the coding structure. Output from Keyword-in-context. Can be useful in exploring the data and developing the coding structure. Two other useful tools in MAXDictio are the Stop/Go lists and the Autocode function. The Stop/Go lists are customisable lists of words that you either want to exclude analysis in terms of the Stop List or words that you want to include in terms of a Go List. PublicVoice has developed a Global Stop List which we apply to all our analysis which is made up of linking and joining words. Along with a Global List, one can create custom lists for a project which could include jargon, technical terms and abbreviations commonly used. 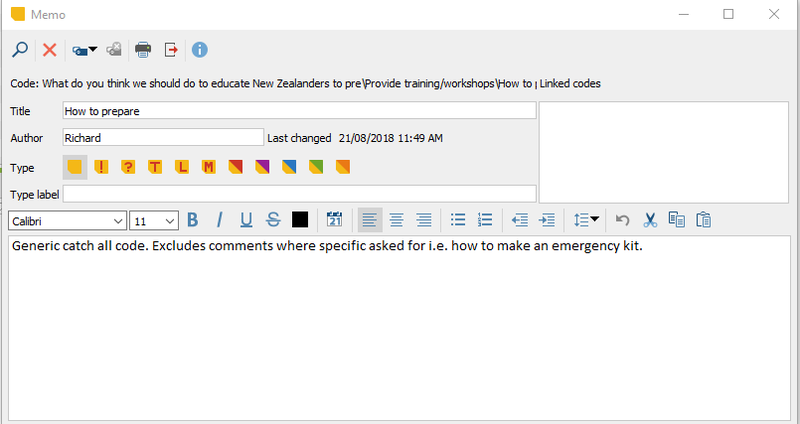 If you have a predefined list of codes you can do auto-coding by creating a new dictionary within MAXDictio. While MAXQDA is largely a qualitative research tool it has a powerful statistics package which enables mixed methods analysis. Using the Stats Module a range of descriptive statistics can be presented. One can compare groups within the data by using cross-tabs and analysis of variance as well as find the correlation between codes by using the Person Correlation coefficient or the Spearman Rank Correlation Coefficient. This analysis is done within MAXQDA and the results can be exported as a table or graph. As well as the traditional word cloud there is a range of other visuals analysts have access to enabling them to present and further explore the qualitative data. This includes MAXMaps which can be used to explore the codes, the relationships between them as well as identify any clusters. All visuals can be exported as a .png or .jpeg file and imported into reports or presentations. As discussed above the outputs from MAXQDA can be exported as a .png or .jpg file in imported into your presentation or report. There is an even easier way to prepare your report with Smart Publisher. 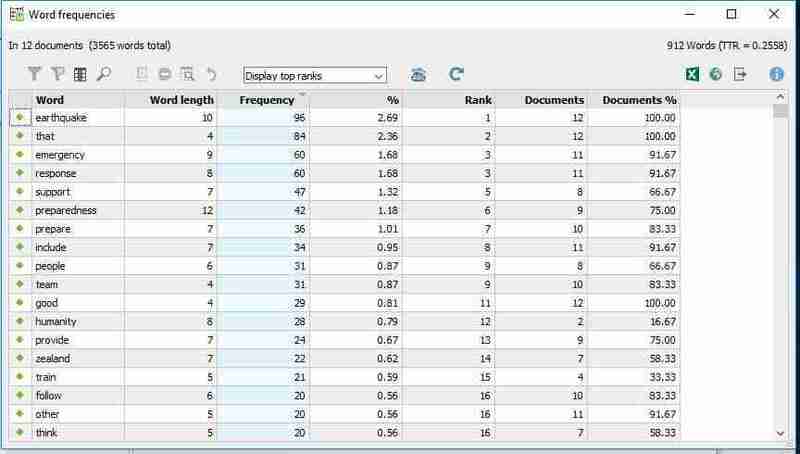 Smart Publisher generates a report based on the coding structure. 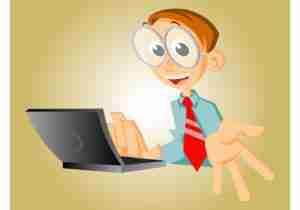 Codes become the chapters of the report while subchapters are established on subcodes. Each chapter of subchapter contains the coded segments with the option to show the position of the code i.e. what document and where in that document that code is located. The name of the analyst who assigned that code along with the date and time it was coded can also be recorded. The final report is a .docx file if you are using a Windows system or .RTF file if using a Mac with the report including a title page, contents page, a list of all the documents included in the report, then the report itself. There are a number of formatting options available including custom report title and subtitle and the option to include two images on the title page. While the final report is in either .docx or .RTF formats the elements of the report are formatted using the Word template file .docx . This allows one to edit the final report including the adding additional pages or content. If you are interested in seeing how MAXQDA will help your next project you can contact us, book a demonstration or download a free 14-day trial.